4 — deeply concerned with matters of faith. I can think of many films directed by men, and focusing on men, that rigorously wrestle with questions about belief and doubt. I grew up with them: Chariots of Fire, A Man for All Seasons, Amadeus. Consider Terrence Malick’s recent string of films, or Xavier Beauvois’s Of Gods and Men. Later this year, we’ll finally have Martin Scorsese’s much-anticipated adaptation of Silence. But The Innocents is a remarkably rare event. * It might rightly be called Of Gods and Women. What a tremendous contribution Anne Fontaine has made to cinema’s library of films about faith! Fontaine takes us back to 1945, one of cinema’s most filmed and familiar chapters, but then veers off the well-worn paths that lead to battlefields and parks her cameras at two unfamiliar locations: a convent where Benedictine nuns (Polish) are praying, singing, and suffering, and a camp in Warsaw where the French Red Cross are working to help wounded soldiers. As we arrive at the camp, so does one of the nuns. She’s begging Mathilde, a young doctor (Lou de Laâge), to risk the fury of the camp commander and come back with her to the convent to save a dying woman. What Mathilde finds at the convent, though, is much more than a pregnant woman in trouble. She finds a traumatized community, one devastated by the war crimes of the “liberating” Red Army. And for these believers, what they have suffered brings an added terror — they believe that God will find them guilty of corruption and send them to hell. Guilty of what corruption? Well, most reviewers will spell out these things for you, but I’m grateful that I had the experience of learning the nature of this story’s horror from the film itself, so I’ll stop there in my plot description. Suffice it to say that these women have every reason to be heartbroken. And so the film admirably invites us to live in the tension of these questions. 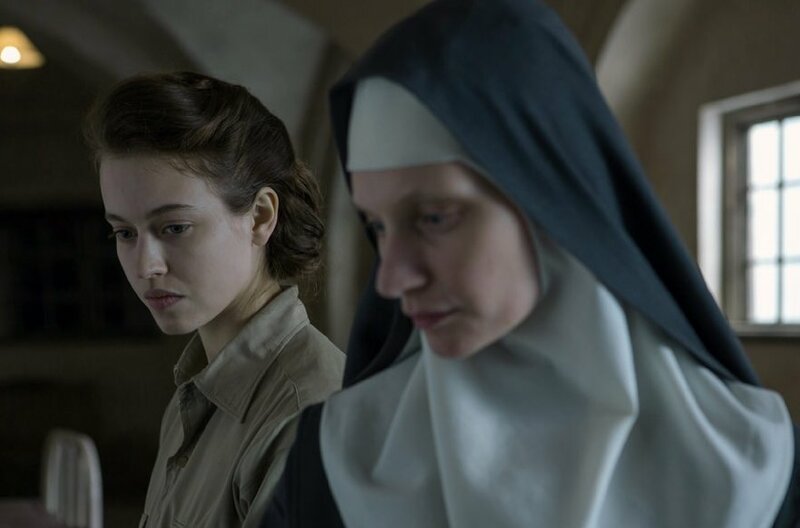 While moviegoer sympathies are more likely to settle within Mathilde’s skeptical and agnostic perspective on the situation — several scenes lean too far in to anointing her as the One Reasonable Human Being — the nuns are portrayed with respect and compassion. And as we watch certain wartime evils rise up and tear Mathilde’s reliance on reason to shreds, we begin to feel, with Mathilde, the allure of Christianity’s consolations. The poster for The Innocents rightly celebrates the film’s most cinematic idea — the black and white of a nun’s habit within the the black and white of a snowbound woods. It suggests that the world itself is a figure that suffers like one of these struggling sisters, caught in a quandary of faith and doubt, the very clash of its colors a manifestation of being torn between opposing forces. That is the image I will remember the most. Beyond that , The Innocents is a movie of faces. Faces that have witnessed horror. Faces reflecting a struggle of failing faith. Faces wide-eyed and mystified by faith. Faces torn by fear and denial. And the shining eyes of Lou de Laâge, which mirror back to us our own stages of incredulity, horror, anger, grief, and fleeting joys. (This seems to be a coronation year for Lou de Laâge as France’s brightest new star — she can also be seen currently starring opposite Juliette Binoche in The Wait (L’Atessa).) By the end of the film, I was still struggling to remember the nuns’ names, but I almost didn’t need them — the faces told myriad stories, and we are invited to find ourselves within many different experiences of faith and doubt. Having said that, I must also note that this film that is much stronger in its characterization, performances, and narrative than it is in its imagery. I wish that Fontaine and her cinematographer Caroline Champetier showed a more poetic visual sense. But I love Champetier’s reliance on natural light; the film’s shadowy passageways and radiant oil lamps; the occasional and startling blaze of flames in a world painted in blacks, whites, and greys. And I love the film’s judicious use of music, giving us long silences and an intimate experience of the convent’s sung prayers. But for the most part, The Innocents is a remarkably respectful film, and one that brings a large cast of female characters to life more fully than moviegoers are accustomed to seeing. What’s more, I was delighted to see one of the film’s only male characters defy my expectations and become a memorably nuanced individual. I saw this at the Seattle International Film Festival, in a packed house, and the audience gave it a warm and appreciative ovation at the end. That was exciting to witness in this oh-so-“unchurched” city. Thanks to my friend Alissa Wilkinson (Christianity Today) for encouraging me to make the time for this one during a week when I really couldn’t afford the time for a movie. I’m glad I did — it was well worth it. We’re in Month #6, and for what it’s worth (this hasn’t been a particularly impressive year yet) — this is my Movie of the Year so far. *Note: I can think of one other recent film that fits the three criterion listed at the beginning of this review: Vision – From the Life of Hildegard von Bingen, which deals with the tension between religion and science, faith and fear, legalism and freedom. But I’m guessing that you haven’t seen it, as it played very few places. Another reader has suggested Higher Ground, a film that is about a woman on a challenging faith journey (but which didn’t particularly work for me). Perhaps you can think of another.